Despite decades of improvements in design, convenience, and features, many strollers are still heavy, bulky, and difficult to manage by yourself. This assertion goes double for the plus-sized double strollers on the market, many of which do not easily fit through doorways or are about as easy to turn as a fully loaded freight train. These factors make choosing the right double stroller for you and your family a difficult choice among very similar options, but there is one guiding principal that should direct your final buying decision: is this double stroller lightweight? Otherwise, read on to find out the important factors to consider before making a buying decision. 1) How much does the stroller weight? 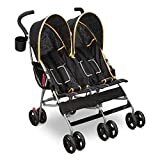 There are lightweight double strollers that weigh as little as twenty-four pounds with all accessories attached, and there are double strollers that are considered lightweight that tip the scale at nearly forty-five pounds. Do you know what it is like to lift twenty four pounds? How about forty-five pounds? We didn’t know what either option was like until we checked them out at a store and did the one handed lift test. To some, forty-five pounds is an easy lift, but to others even twenty-four pounds can require significant effort to lift with one hand. Make sure you test out the weight of your stroller with a one handed lift before buying so that you know what you are getting into in terms of everyday lifting for loading it and unloading it from your vehicle. Your future self will thank you. 2)How much weight can the stroller carry? As with actual carrying weight, strollers also vary in the overall weight capacity they can handle per seat and in total. You need to check to see if the weight capacity listed for your double stroller is the total weight capacity for two passengers, or the total passenger weight for each seat.You also want to make sure you find out what the total carrying capacity is with passengers. If you want to stow diaper bags or other items in the stroller for that trip to the beach or the park you need to make sure you are not overloading and damaging your stroller. 3) How does the stroller fold, and what are its folded dimensions? 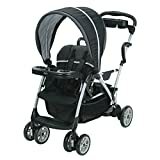 While it may seem rather trivial how a stroller folds on first examination, you would be surprised how important that becomes when you are trying to set the stroller up after you arrive at your destination, or fold it back down before heading home. Some double stroller offer easy, one handed operation that just require you to brace your foot against the base of the stroller and pull back on the handle to fold everything up. Others, however, may fold forward onto their wheels and lock into place, making you lift the stroller up from where it rests on the ground. Both designs have their pros and cons, but it is definitely something you want to know before making a purchase as it will largely determine how quickly (or slowly) your stroller can be set up. The other important pre-purchase factor that goes along with folding is the double strollers dimensions when folded. While it may look nice and compact in the store when stowed neatly in its carrying case, that doesn’t necessarily mean it will fit in your car’s cargo area or storage space. Some families really need the extra space of a double stroller, but if the stroller takes up so much space that you can’t fit both kids in the car comfortably, it is going to be more of a hazard than a help. Make sure that you know how much space it is going to take up in advance so you can make a more informed decision. What kinds of materials are used to make the stroller you are considering? Is it mostly plastic with few metal parts? Is it stainless steel? Aluminium? Are the wheels pneumatic or non-pneumatic? Does it have an emergency brake? Do the front wheels lock? Is the locking mechanism high quality? Do the seats have safety harnesses? Are they padded or just woven polyester straps? Are all the buckles and snaps high in quality? Are the trays removable and machine washable? Are there adult-size cupholders and a storage tray on the push bar for adults? Does the folding mechanism function smoothly? Does the stroller lock folded or unfolded securely? Does the locking mechanism feel durable? These are all questions you need to ask yourself before you decide to buy a stroller. These are the details you wish you would have considered that will irk you constantly if you get a stroller that isn’t built to a high standard of quality and reliability. Make sure to test it out or check up on its quality before making a buying decision. You will be glad you did. One of the key indicators of a stroller’s quality of build and convenience of design and function is a brand’s popularity. After all, if everyone is buying them and people aren’t standing in long lines to return or exchange a particular stroller, then it stands to reason other parents found it a good fit for their needs, too. Another advantage to checking brand popularity is compatibility with other accessories and devices from the same manufacturer. For example, if you have a Graco Infant Car Seat and a Graco double stroller, that infant car seat will neatly lock right into one of the seats on your stroller with no fussing or difficulty. Just lift, set, and listen for the click. Sticking with one brand or manufacturer really does make a difference in your enjoyment and appreciation of your stroller, and increases the likelihood that you will get significantly more longevity out of your purchase. 1) How old are your children, and how big are they? As the old saying goes, babies don’t keep. Your little ones are growing every day, and as they grow your stroller needs are going to grow with them. 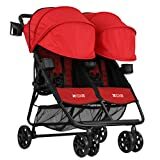 You want to make sure you know how much each of them weighs and how tall/long they are before buying a stroller so you can get the most value for your purchase in the long term. After all, a double stroller will not do you much good if your child is easily walking on their own and fast getting too tall for a stroller you are considering as a purchase. 2) What features do I want? If you are like most parents, you need to have your caffeine within easy reach while you are out with your kids in the stroller. Consider what strollers have accessories for your convenience, too. Sunshades and snack trays for kids are great, but having a safe dry place to stow your keys or mobile phone while you are out for a walk is even better. 3) How often do you travel? If you don’t go out often and you don’t travel frequently for family or for fun, then you want to consider those as factors in your stroller purchase. Frequent travellers are going to need a more durable, feature packed stroller for all that sightseeing and errand running, whereas a once or twice a week trip to the grocery store and occasional walks in the park means you have far less demanding stroller needs. This also helps you with the last consideration for purchase. 4) Do you have a budget for your purchase? You can easily buy a full featured, world class, high end double stroller with every imaginable feature for your children, but if you are not in possession of limitless financial resources like most people, you will need to set a limit on how much you spend. After all, you don’t want to overspend and get a double stroller that could attempt an ascent on Mount Everest for running to the store and the occasional park day. If you pick a price point and stick to it, it will definitely help you find the best stroller for your family’s needs. Buying a lightweight double stroller doesn’t have to be complicated if you do your homework in advance and fully test out all the functions and features before you buy. 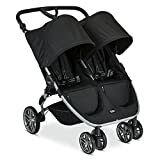 Read over this lightweight double stroller guide again to help you determine both what you want and what you need, and then head on out to the store or log on to your favorite online retailer. You can buy with confidence once you know how to choose the best. Copyright © 2018 by Super Baby Gear. Web developed by TSB Web Consulting.